The movie is supposed to be about Harilal Mohandas Gandhi but ends up becoming about Gandhiji and India's freedom struggle. Though the audience is denied insight into the minds of the characters, they are given some brilliant performances by the lead cast. The title, the promotional previews, and the other media publicity all give the impression that this movie is about Gandhi Jr., Harilal, and his struggle with being under the shadow of such a dynamic father. But, at the end of it all, it comes across as a tool to sensitize the country to the fact that Gandhiji made many more sacrifices than meets the eye. Yet another movie from Gandhiji's point of view. The emotional trauma of Harilal, Baa and the rest of the family is side-lined. The experience feels incomplete. The movie starts out brilliantly. I was truly intrigued by the way we see Gandhiji as a father. You could see the human element instead of the usual demi-god status that this simple man is accorded. The parent-child problem felt so real because it was so much like any other parent-child problem - diverse expectations, disappointment in both directions, and the inevitable frustration. It really threw light on a totally different aspect of Gandhiji. Alas, the cookie crumbles. And the director could not maintain this tension past the first half hour. Soon enough, Gandhiji is put back on the pedestal. And the movie becomes a documentation of the history of our independence. A snippet of what Gandhiji was doing at that time, and another of what Harilal was doing at that time - literally alternating rhythmically. This also gives the movie a very choppy feel. Scenes just cut into each other under the guise of fade-ins and fade-outs rather than flowing with the narrative. It's the actors that make this worth a watch. You could feel Gandhiji's inclination towards his aspirations for the country while feeling responsibility towards his family. Darshan Jariwala has done great justice to portray the various shades of Gandhiji's personality - calm, preachy, upset, firm, ambitious, etc. I usually don't care for weak, loser-type characters in stories. But, Akshaye Khanna makes you feel for the nervous, diffident, eager-to-please Harilal who has a huge image to live up to. You can sense the pressure the son faces - wanting to impress his father but fortunately or unfortunately discovering that he has a mind and ambitions of his own. Shefali Shah, as usual, leaves you spell-bound. One look at her and you can imagine what Baa must have been going through at that time. Her make-up person needs special mention - each wrinkle seemed to have received minute attention. And I cannot forget Bhumika Chawla's expressions of frustration and helplessness, though she had very little time on the screen. I found the background settings extremely distracting. For a movie set in the early-mid 20th century, and for a not-so-bright subject matter, the colors seemed too bright and the objects in the background too new. These things took away from the drama that could have been created. Also, clichéd use of rain to demonstrate pathos in the life of the characters was too in-the face. The solemn background music could not do much to retain the drama given the cheerful visuals. Of course, it could be argued that colors of our walls do not change according to whether we are happy or sad, but a freshly painted wall in the room of a person who doesn't have enough to feed his family, just doesn't gel. My main complaint though remains that we are not allowed entry into the minds of the characters. A huffy-puffy Harilal is not enough to convey his frustration. His motivations are never explained. Or for that matter, Gandhiji's justifications for his decisions were not clarified either. Even if we do give the benefit of doubt that such information might not be available, the question remains - why make a movie about relationships without knowing the rationale behind the characters' behavior? I set out to see what being a son to the father of our nation was like. I came out with glimpses of their relationship and a whole lot of unanswered questions. Fortunately, I also came out with some fine performances by the entire cast. Which is enough to keep the movie from being a complete disappointment. Update: David McDonald has left us a very interesting comment in the notepad section which clarifies a few of my issues with the movie. Please chip in with what you think and let the discussion continue. Yay! Thumbs Up, by Thailand floods : realy nice one but i did nt understand the last part of it. 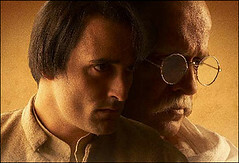 The movie tries to portray the relationship between Gandhiji (Darshan Jariwala) and his oldest son, Harilal (Akshaye Khanna). A silhoutte scene occurs twice in which Gandhiji and his son are shown meditating/discussing. The visual gives a very serene feel. The Gujrati folk songs sounded really refreshing. Not allowing Harilal to get married. Why did he not explain it to Harilal? Accepting Harilal after having said that he would disown him. Not allowing Harilal to do his degree in law? Did he know that Harilal was not capable of it? Joining Gandhiji's freedom movement more than once. Visiting a prostitute and asking her to talk to him. The discussion about Gandhiji's freedom struggle between Gandhiji and Baa - the questions that Baa was asking sounded too naïve in the last few hours of her life. Especially, considering she had been involved in the freedom movement from the beginning. Who was Gandhiji lecturing at the time of partition in the alley, us the audience? The boat scene in which Harilal reads his wife's letter - looked so artificial and out of place, they should have cut it out. All "bindis" and "tilaks" looked like they were marked using a lipstick on the characters' foreheads. There is a scene in which Gandhiji is shown sitting on a couch on a sea-shore. Couch on a sea-shore?! In the scene in which Harilal is drunk after having become a muslim. There is a scene in which there is rain pouring on the street. It looked like it was pouring only on parts of the street! In the same scene a flashlight shines on Harilal's eyes, but his eyes don't cringe one bit. Thanks for pointing that out, Subrat. I think this site is having this particular problem with IE 6.0. We are trying to fix it, hopefully it will be done in the next 2-3 days. Please, do let me know if you are using some other browser. Deepa, well, I would still recommend a watch on DVD, the performances themselves are worth it. Alphabetical listing - technical glitch, now fixed. Deepa, I am in the same boat - the first few reviews that came out were glowing with praise, and I was looking forward to it. Now with Meetu's and also noting the 3/5 average in the "to each his own" I'll probably wait for DVD. Subrat, the overlap should be fixed now. Please let us know if it is still happening. Thanks for confirming that the overlapping has been fixed, Subrat! Join the gang, I don't think anyone except Hetal and Anuja, and yours truly have seen the movie here. Waiting for your reaction to the movie, though. About the rationale behind characters' behavior - I find it especially disturbing in a character driven script. E.g., we sort-of have learned to not carry this expectation in a "Partner" or a "Cash", but here we want to watch the movie only for the characters. "Making of the Mahatma" on my ever-growing 'To watch' list. Thanks for the suggestion. David McDonald has left us a very interesting comment which clarifies a few of my issues with the movie. Please chip in with what you think. Thanks, Jaya! Well, I think I have given my reasons for not liking the movie as much, so will avoid repeating myself. Jaya, I am actually glad they did not show too much of the siblings, because that would distract further from the father-son relationship. In general, I like movies that stay with one or two main points. This movie was supposed to be about Harilal and his relationship with his father - I am glad they tried to stick to that as much as possible. Thanks for taking the time to jot your thoughts down and keep coming! bollywood songs has posted 1 comments and has rated 0 movies. 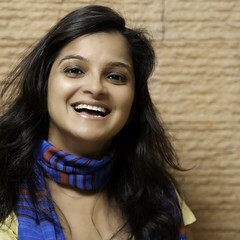 See bollywood songs's page for more details.